We propose a novel weakly-supervised semantic segmentation algorithm based on Deep Convolutional Neural Network (DCNN). Contrary to existing weakly-supervised approaches, our algorithm exploits auxiliary segmentation annotations available for different categories to guide segmentations on images with only image-level class labels. To make the segmentation knowledge transferrable across categories, we design a decoupled encoder-decoder architecture with attention model. In this architecture, the model generates spatial highlights of each category presented in an image using an attention model, and subsequently generates foreground segmentation for each highlighted region using decoder. Combining attention model, we show that the decoder trained with segmentation annotations in different categories can boost the performance of weakly-supervised semantic segmentation. The proposed algorithm demonstrates substantially improved performance compared to the state-of-the-art weakly-supervised techniques in challenging PASCAL VOC 2012 dataset when our model is trained with the annotations in 60 exclusive categories in Microsoft COCO dataset. Figure 1 illustrates overall architecture of the proposed algorithm. Our model learns knowledge for semantic segmentation for images with weak-annotations (target domain) by leveraging strong annotations from different categories (source domain). Figure 1. Overall architecture of the proposed algorithm. Given a feature extracted from the encoder, the attention model estimates adaptive spatial saliency of each category associated with input image. The outputs of attention model are subsequently fed into the decoder, which generates foreground segmentation mask of each focused region. During training, we fix the encoder by pre-trained weights, and leverage the segmentation annotations from source domain to train both the decoder and the attention model, and image-level class labels in both domains to train the attention model. After training, semantic segmentation on the target domain is performed naturally by exploiting the decoder trained with source images and the attention model adapted to target domain. The proposed algorithm outperforms all weakly-supervised semantic segmentation techniques with substantial margins, and even comparable to semi-supervised semantic segmentation methods, which exploits a small number of ground-truth segmentations in addition to weakly-annotated images for training. We refer the paper for more results. Table 1. Evaluation results on PASCAL VOC 2012 validation set. G. Papandreou, L.-C. Chen, K. Murphy, and A. L. Yuille. Weakly-and semi-supervised learning of a DCNN for semantic image segmentation. In ICCV, 2015. P. O. Pinheiro and R. Collobert. From image-level to pixel-level labeling with convolutional networks. In CVPR, 2015. S. Hong, H. Noh, and B. Han. 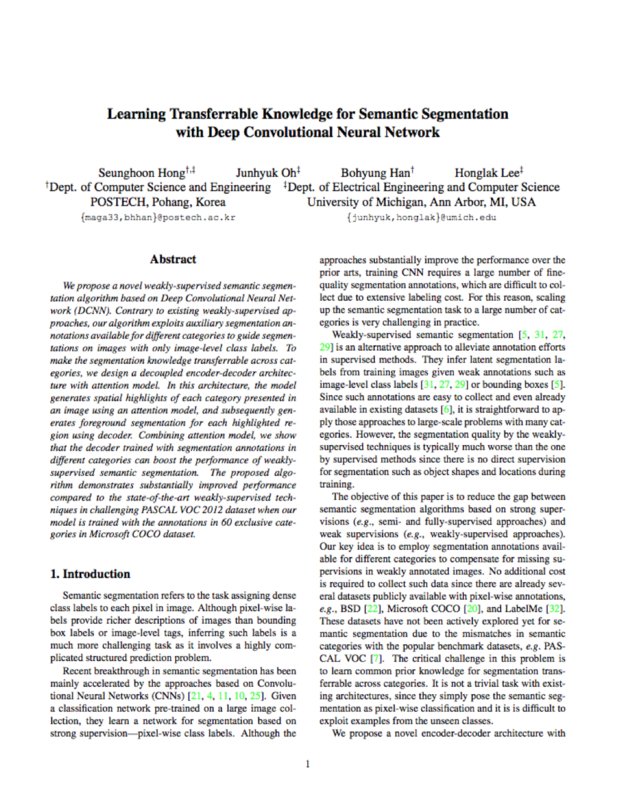 Decoupled deep neural network for semi-supervised semantic segmentation. In NIPS, 2015.